This is a simple soup recipe using crab meat as the main ingredient. And the only vegetables used here to are potatoes and parsley. If you are thinking where to get a seafood food recipe, maybe you can try this. 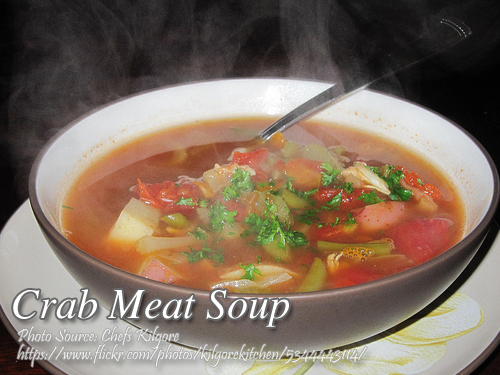 To cook crab meat soup; Fry the tomatoes, garlic, and onions in 1 Tbsp butter until the onions are soft but not brown. Set aside. In another pan, make a roux by melting 2 Tbsp butter and blending 1 Tbsp flour stirring continuously for about 2 minutes. Slowly stir 4 cups of water, crab meat, fried tomato mixture, diced potatoes, vinegar, salt, pepper and parsley together. Simmer for one hour until the potatoes and crab meat are tender. Fry the tomatoes, garlic, and onions in 1 Tbsp butter until the onions are soft but not brown. Set aside. In another pan, make a roux by melting 2 Tbsp butter and blending 1 Tbsp flour stirring continuously for about 2 minutes. Slowly stir 4 cups of water, crab meat, fried tomato mixture, diced potatoes, vinegar, salt, pepper and parsley together. Simmer for one hour until the potatoes and crab meat are tender. Serve hot.